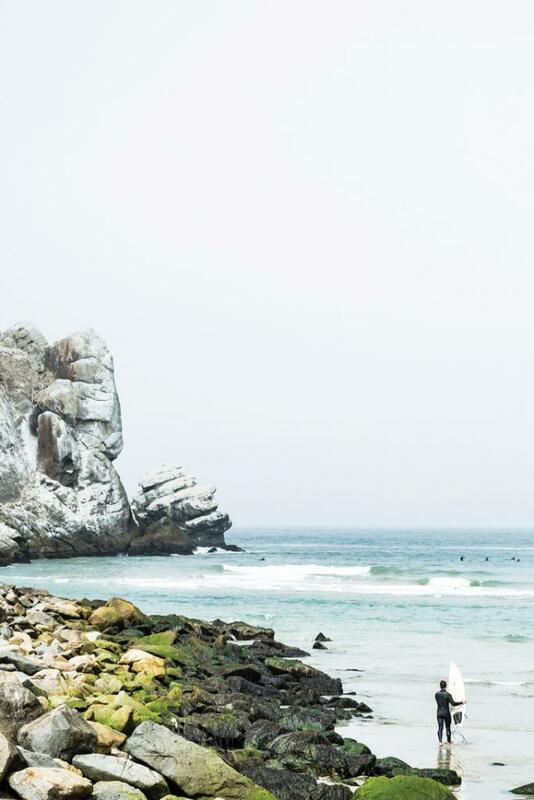 52 Perfect Weekend Getaways In and Around L.A.
Home Architecture 52 Perfect Weekend Getaways In and Around L.A.
You already know it’s true, so don’t be modest: The part of the world you call home happens to be what people all around the globe call a vacation destination. Within three hours of drive time, you can find temporary refuge on an inviting beach, sip your fill among vineyards, luxe up at an impeccable resort, or wind down in a hip little trailer camp. Dog vacays, kid-friendly escapes—they’re here, too. Time to start putting all that proximity to good use. There are 11 viticultural areas and 200-plus wineries here, so pace yourself. Start near the old town square, with its Carnegie Library and gazebo, and take your pick of tasting rooms, including Paso Underground, where the acclaimed Copia is among the small wineries featured. It’s close to Artisan, James Beard-nominated chef Chris Kobayashi’s farm-to-table showcase, as well as the elegant boutique Hotel Cheval ($295-$475; try the nightly s’mores service in the courtyard). Though visiting wineries such as L’Aventure and Tablas Creek Vineyard is a must, don’t skip the premium oils milled at Kiler Ridge Olive Farm. While the seed companies have left the erstwhile Valley of Flowers, the ocean-influenced Sta. Rita Hills American Viticultural Area, east of town, is known for varietals that love the region’s fog and cooling winds. The Lompoc Wine Ghetto’s industrial-park setting lacks Tuscan-inspired romance, but this cluster of tasting rooms attracts serious oenophiles with its prime small-batch producers. Hotels are chainy—a Hilton Garden Inn ($189-$289) opens this month—and Lompoc’s food scene is still catching up, but you can pair crisp thin-crust pizzas with local wines at D’Vine Wine Bar & Bistro. Thirty-plus wineries dot the Inland Empire’s very own wine country, including the micro winery Briar Rose (with buildings fashioned after Snow White’s cottage, no less) and Monte De Oro. Avoid a DD with companies like Grapeline Wine Tours, which will shuttle you to various properties for wine flights. Speaking of flights, you’re in SoCal’s unofficial hot air balloon capital, so get altitudinal before settling down at the Inn at Europa Village ($190-$325), where rooms look onto the vine-studded sprawl and rugged Palomar Mountain. Avenida Revolución’s rowdy bars have given way to Baja’s gastronomic boom. For peerless Tijuana seafood tacos, hunt down chef Oso Campos’s Tras Horizonte, which melds Mexican street culture with pro technique. Javier Plascencia’s flagship, Misión 19, serves modern dishes like pen shell clam stacked with sweet and savory layers. And Baja’s craft beer current flows at Mamut Brewery Co. One Bunk Tijuana, the area’s first boutique hotel (opening this summer), offers rooms with urban-industrial touches. A block away is the birthplace of the Caesar salad, Caesar’s Restaurant, where you can get beef Wellington before catching top Latin artists at the Foro. A handful of prosperous Angelenos have pulled up stakes and transformed this 100-plus-year-old stagecoach stop into a foodie destination. Bob’s Well Bread: Ex-Sony marketing chief Bob Oswaks has reinvented himself as a baker at the former gas station, where everything from the sourdough to the kouign-amann sells out by noon. Bell Street Farm: The old bank dispenses some of the best porchetta outside Italy. Onetime ad whiz Jamie Gluck partners with CBS exec John Wentworth in this gem of a café. Wine Saloon at The 1880 Union Hotel: Actor Kurt Russell once ran the bar at this historic site to serve wines from his Central Coast operation. The interior looks, fittingly, like a set from a Russell western. Babi’s Beer Emporium: Actor Emilio Estevez and winemaker wife Sonja Magdev-ski stock hard-to-find craft beers in the former post office. Skyview Motel: Stay in throwback mode at this classic motel revived by the folks behind San Luis Obispo’s Granada. With the South Bay’s emergence as a cauldron of craft beer, you have one more excuse to stay local. Raise your brew IQ with the four-and-a-half-hour L.A. Beer Hop tour, which starts and ends at the El Segundo Metro station and hits three breweries (each offering four five-ounce tasters) along the way. Afterward Lyft it over to David LeFevre’s Fishing with Dynamite in Manhattan Beach for some “chow-dah.” The luxury yacht-inspired design at the nearby Shade Hotel ($329-$1,999) keeps the nautical theme alive and well. Make time for a swim in the rooftop pool before packing up. A flagpole marks the spot in this Santa Ynez Valley town. Just steps away is Kaena, which excels at grenache; and Stolpman, where Sashi Moorman works magic with syrahs. Don’t pass up the house-smoked bacon—as thick as a steak—that chefs Matt and Jeff Nichols serve at Sides Hardware & Shoes. For more local fare head to the the Bear and Star restaurant (with meats from the Parker family ranch). You can lodge three miles away at the Ballard Inn ($309-$649), where owner Budi Kazali cooks Asian dishes with a French twist. 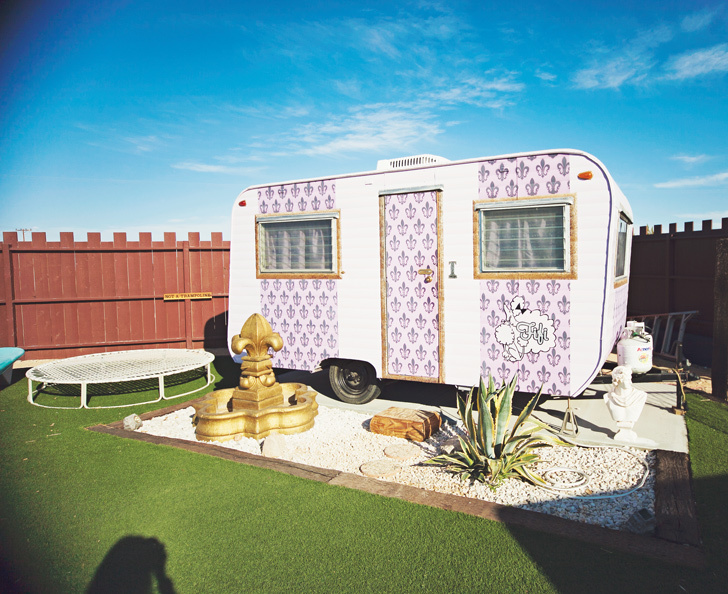 Joshua Tree’s Hicksville splits the difference between camping and glamping. Each of the nine trailers ($85-$265) has its own theme (the ’70s for one, the circus for another), but most don’t come with kitchens or bathrooms (the clubhouse has toilets and showers). 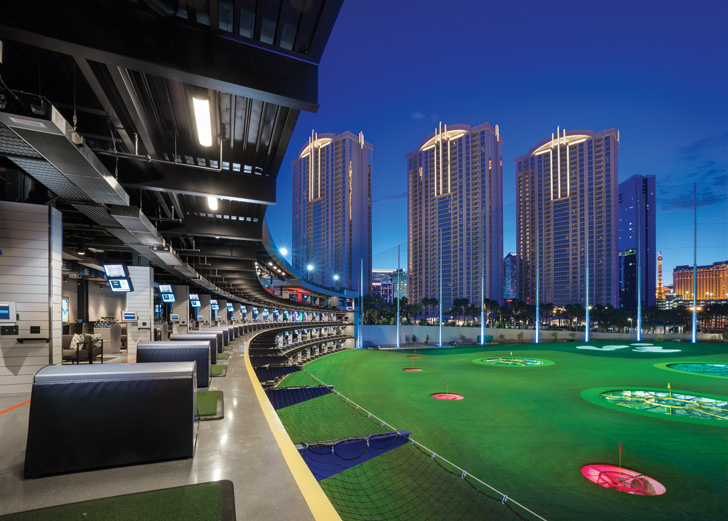 Bring your own supplies for the charcoal grills, but don’t sweat the entertainment: You can goof around with BB guns, putt-putt golf, Ping-Pong, even an archery setup while the jukebox plays. There’s a soaking pool to tame the desert heat, while the rooftop hot tub is perfect for a nighttime dip to the soundtrack of yipping coyotes. 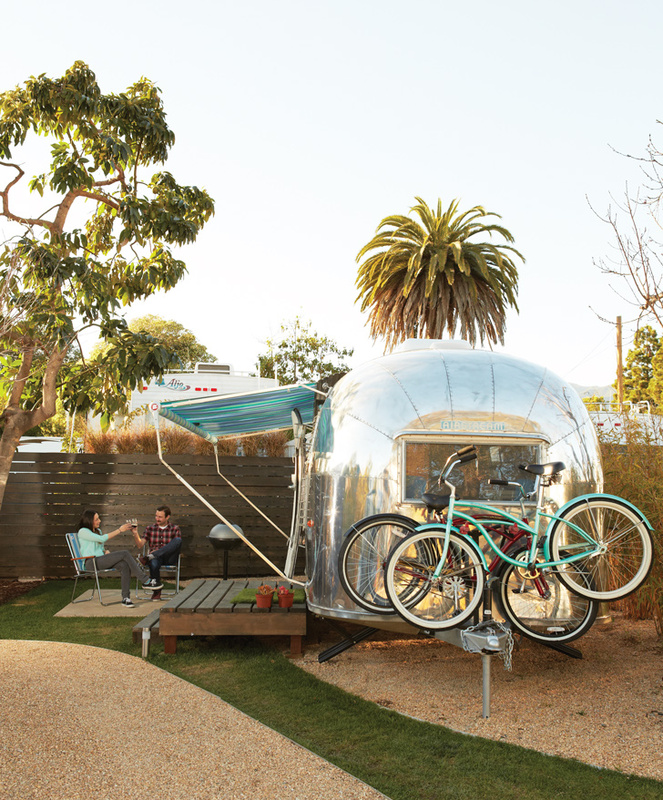 AutoCamp Santa Barbara’s Airstream trailers ($175-$350) bring midcentury American muscle to this city of Spanish Colonial romance. Pedal one of your trailer’s beach cruisers to the Mill, a rustic complex in a renovated 1904 feed-mill building that’s home to Potek Winery and Third Window Brewing Co. Down in the Funk Zone, Lafond Winery’s tasting room is among 20-plus stops along the Santa Barbara Urban Wine Trail. Housed in a 1920s fish-processing building with exposed rafters, the Lark is named for the passenger train that used to cruise by. With such dishes as grilled octopus and Dungeness crab risotto, seafood still holds a place of honor here. Check out Air-bnb and you’ll discover eight Malibu Airstreams ($99-$600); one is used in fashion shoots and tricked out with a wall of glass panels that opens onto a cantilevered deck, while another is an off-the-grid 1973 Land Yacht Tradewind that blends some vintage notes into your escape. Each plunks you down in the true ’Bu, beyond the Pacific, where the forever views take in ruddy Boney Ridge and the distant Channel Islands. There’s hiking nearby on the Backbone Trail and tastings at Malibu Wines along Mulholland. As for the beach, just point the car downhill. You’ll be there before you know it. Opened last July off Ojai’s main drag, Caravan Outpost ($169-$369) masks its business-park locale with good feng shui and strategically placed vegetation, featuring amenities that other trailer hotels don’t offer. Some of the 11 pristine Airstreams are stocked with memory-foam mattresses, plush linens, and record players (raid the Outpost’s vinyllibrary). To supplement the camper facilities, there are communal grills as well as bathrooms outfitted with subway tiles by the corrugated main building. Come sundown, a host builds fires, washes dishes, and does the turndown service, dispensing tips on how to spend the next day. Disneyland’s early renderings depicted guests elegantly dressed in hats and gowns. To bring that glamour to life, Disney fan Justin Jorgensen created the annual Dapper Day. 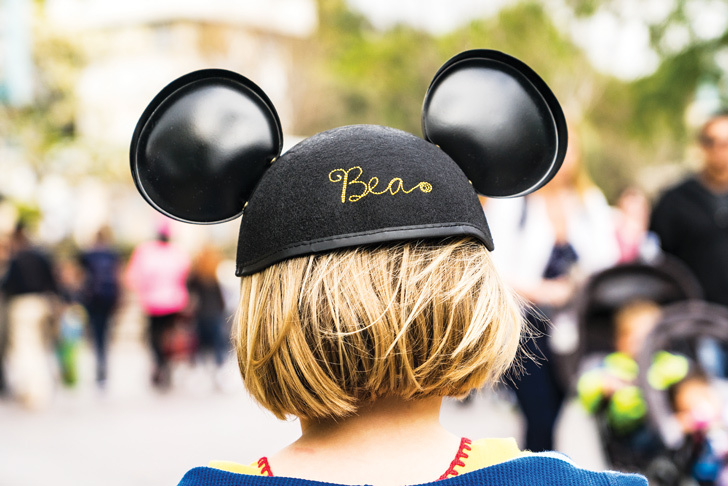 Here are his tips for doing the Happiest Place on Earth in style. Breakfast: The Jungle Cruise Sunrise Safari Breakfast is ridiculously expensive [$300], but it sounds fun. You get into the park before the animatronics wake up, board your boat, and disembark in the African savannah, where your crew has set up a breakfast outpost. Lines: When I’m with friends who insist on seeing everything, I get a FastPass for Space Mountain. For Splash Mountain or Indiana Jones, I get in line as the fireworks are ending because everyone is distracted. Lunch: You really have to look for White Water Snacks. It’s tucked away near the Grand Californian pool, and you’re seated essentially in this secluded wilderness that feels like a Northern California redwood forest. The pulled-pork sandwich is highly recommended. Lodging: I just love the Grand Californian [$417-$1,970]. It’s dark and heavy and quiet, and it’s so relaxing after being out in the bright sun all day. There is a little-known observation deck on the southeast corner that overlooks Paradise Pier. You access it with your room key, and it has speakers that allow you to enjoy World of Color. Rumor has it that the zoo is pretty good. 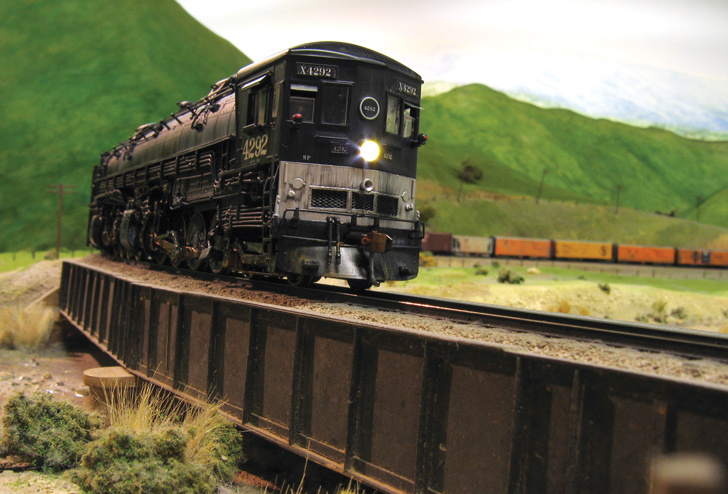 And while Balboa Park’s Spanish Colonial Revival architecture and larger museums draw the most attention, the San Diego Model Railroad Museum is an offbeat microcosm for kids. Nontouristy restaurants can be found while strolling the sidewalks of nearby North Park, or take the progeny to Little Italy to sample Extraordinary Desserts. If they are of the mellow variety, skip the big hotels of Mission Bay for a stay at Tower23 Hotel ($229-$469) in Pacific Beach, where the rooms’ streamline neomodernist touches contrast with the boardwalk’s honky-tonk elements. And it’s right by the Crystal Pier. Little about Monarch Beach Resort ($450-$731) screams “bring the kids,” which is partly why it works so well for families. There’s a kids’ club to keep them busy if you want to hit Miraval Spa or the links that spread out between the hotel and the ocean. A private beach is a ten-minute tram ride away, and if you splurge on a suite, you can scorch some marshmallows at your personal fire pit. If Michael Mina’s Stonehill Tavern proves too dressy for the fam, downtown Dana Point is nearby with loads of options. 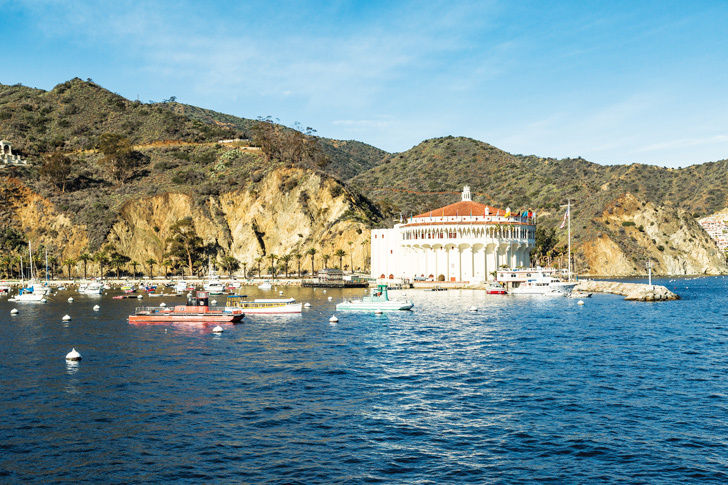 Save some time for a stop at the harbor’s Ocean Institute. Historic downtown San Juan Capistrano is on the way home. After visiting the mission, walk among the settlers’ rickety cottages on Los Rios Street—it’s a revelation. The petting zoo there is elaborate, while the Ramos House Café is a comfort. Famous for March wildflowers that in some years paint its tawny expanses with vivid pinks and golds, Anza-Borrego Desert State Park is also home to less ephemeral pleasures. 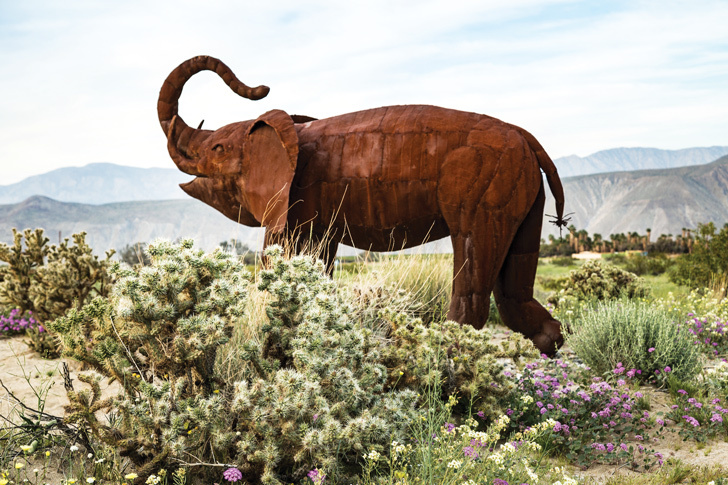 A three-mile round-trip hike near the visitor’s center leads to the Borrego Palm Canyon oasis, while more remote groves farther south in the park, at Mountain Palm Springs, offer a beat-the-crowds alternative. Off Highway 78, drive into the badlands for the short descent into the Slot, a narrow passage where the eroded walls almost touch. An even deeper slot is accessible via the four-mile round-trip trek into Palm Wash along Highway S-22. Base camp is Borrego Springs. The Borrego Art Institute’s Kesling’s Kitchen, named for modernist William Kesling, who designed the building, serves wood-fired pizzas and salads. On the edge of town at venerable La Casa del Zorro Desert Resort & Spa ($110-$939), skip the casitas and stay in a renovated deluxe room, with wood-burning fireplaces and Southwest details. 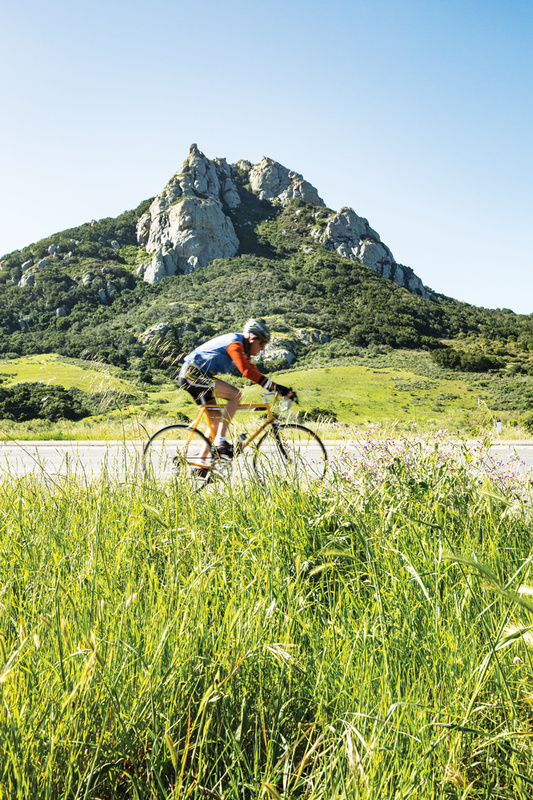 Pedaling the hills of SLO is a whole other way to experience Central California. If the ten miles of single-track mountain biking in the Irish Hills Natural Reserve isn’t enough, the guys at Art’s Cyclery can offer tips. Your base, the exposed-brick Granada Hotel ($249-$599), offers stylish, compact rooms and a nice second-floor terrace. Located downtown, it’s within walking distance of the bacon-cheddar scones of Scout Coffee and the 76-tap Libertine Brewing Company. Or hit the Foremost Wine Co., which serves dishes like crispy potato tacos and duck leg sugo pappardelle in a renovated 1926 creamery complex. The waters are so calm, it’s easy to spot the giant American white pelicans, the strikingly patterned Brant geese, the sparkling blue belted kingfisher, the ducks too numerous to count, and the occasional peregrine falcon on your Central Coast Outdoors kayak excursion. The tour glides to a working oyster farm before pausing at the sandspit for a generous lunch (where did the guide stow all that food?). At night sample the local oysters at the Galley, which excels in seafood. Take a last look at the bay from a room at 456 Embarcadero ($139-$599), a traditional inn updated with contemporary decor. Snow summit and Bear Mountain have seen some $2 million of improvements since Mammoth Mountain bought the Big Bear resorts in 2014. Among them: Snow Summit, which offers the area’s only lift-served mountain bike park, has designated terrain for novice riders. You can also mix it up and learn to wakeboard on Big Bear Lake (alas, the Cable Park, where you could board without a boat, is not coming back this summer). Cabins are easy to come by here, or soothe your bruised ego at the Best Western Big Bear Chateau ($126-$436). Riding horseback through the rolling hills of the Santa Ynez Valley, you’d be forgiven for thinking you’re in a happy, G-rated version of Westworld. Alisal Guest Ranch & Resort ($395-$775) was built with bucolic fantasies in mind. In between rides (there are the two-wheeled kinds on the local roads as well; Alisal will even pack lunch), you can always golf and get kneaded in the spa. But just lounging outside your western-tinged suite isn’t so bad either. Welcome to life on a dude ranch. There are only two ways to secure a tee time at the storied Rancho Santa Fe Golf Club: Be a member or book a stay at the Inn at Rancho Santa Fe ($289-$1,159). The low-slung 1920s complex was designed by architect Lilian Rice, who is the woman behind the graceful Spanish Colonial Revival look of the San Diego County town. For post-golf refreshment, head to Ponsaty’s, a fine-dining restaurant with a French master chef, two terraces, and a lively bar. The Tom Fazio-designed course at the Fairmont Grand Del Mar ($395-$895) winds through the Los Peñasquitos Canyon Preserve, an unspoiled landscape so soothing, you won’t mind a bogey or two. The hotel, on the other hand, is filled with man-made riches, from a rare red marble to gilded banisters. The spacious rooms are impeccably decorated, and the grounds are dotted with water features and other visual treats. The hotel provides its own nightlife at Club M, while its restaurant, Amaya, boasts fine Italian fare and a plush bar. At sunset the craggy peaks that form the backdrop of La Quinta’s ultrachallenging mountain course—among the Coachella Valley’s most in-demand patches of grass—glow coral pink. (The slightly more forgiving Dunes course is a looker, too.) You can cool off in one of La Quinta Resort’s ($144-$1,709) 41 pools, or lounge in one of its ’20s-era casitas. Skip the clubhouse and grab dinner at Morgan’s, where the kitchen does farm-to-table with flair. The third hole of the south course, atop La Jolla’s coastal bluffs, is among golf’s most scenic. The easier north circuit begins where the south course finishes: the Craftsman-style Lodge at Torrey Pines ($349-$8,000). It’s about as close as you can get to staying in the Gamble House. The stained-glass entry doors are by Highland Park’s Judson Studios, while works by California painter and ceramist A.R. Valentien decorate the New American restaurant that bears his name. Paradise—if you can earn it. You disembark from an Island Packers catamaran out of Ventura or Oxnard, then haul your gear, food, and water to a primitive campground on one of the five islands. Which to choose? Santa Rosa’s Water Canyon campground puts you within a mile of a white-sand beach, or bed down at eucalyptus-shaded sites at Scorpion Anchorage on Santa Cruz, one of the few camping areas with potable water. On remote windswept San Miguel, head out on ranger-led hikes through the mineralized stumps of ancient trees to Point Bennett. Thousands of seals and sea lions, six species in all, laze on the beach. After arcing along Coronado Bay Bridge onto quiet residential streets, you feel worlds apart from San Diego. With 19th-century roots and beachfront real estate, the red-roofed Hotel del Coronado ($400-$2,500) warrants a splurge. A few blocks up the road, the visitor’s center features a small museum (bar trivia: Charles Lindbergh flew The Spirit of St. Louis from here), while the old-school Miguel’s Cocina serves tasty margaritas on a buzzy patio nearby. Five miles away, Silver Strand State Beach offers a taste of the island’s less-traveled side. Balboa may not be a tropical isle, but the place is exotic in its own way. Walk along Marine Avenue, the teeny main drag, eating a Balboa Bar ice cream from Dad’s or Sugar ’n Spice (both claim to have invented it) before tracing the island’s perimeter past the multimillion-dollar homes. Balboa’s four-car ferry can take you to the peninsula for a ride on the Ferris wheel. Then regroup with a cocktail and some scallops from the eclectic menu at the Royal Hen. Rent a house for the full effect or luxe up at the expansive Resort at Pelican Hill ($695-$3,145), a few miles down the coast. Embrace your inner tourist. An inland tour to spot buffalo? It’s required. Fish-gazing on a glass-bottom boat? Of course. Parasailing? Maybe, though zip-lining the canyons has its perks (a new drop tower opens this summer, too). Buffalo milk cocktails at Luau Larry’s in Avalon? There’s no shame in that. Add a spritz of exclusivity with a private cabana on Descanso Beach and you’ve got yourself a one-of-a-kind weekend. To rest after all that relaxing, try the Pavilion Hotel ($165-$379), a tasteful redo of a courtyard hotel that sits near the Avalon Grille and, more to the point, across from Avalon Bay. 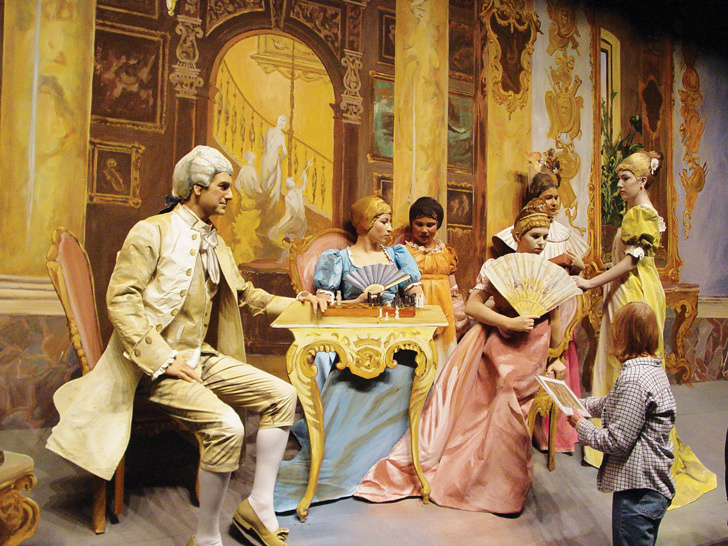 This summer marks the 85th anniversary of the quirky Pageant of the Masters, where a cast of hundreds re-creates classic art in the form of tableaux vivants, or oddly compelling “living pictures.” (This year’s theme: The Grand Tour.) Before the evening festivities, stop by the Orange Inn (established in 1931) for a house-made muffin and some local gossip. After the pageant, it’s less than a mile to the crisp, contemporary Inn at Laguna Beach ($469-$949), where you can fall asleep to the sound of the surf outside your window. More than 95,000 fans of midcentury modern architecture and design find their way to the desert each February for Modernism Week. The “fall preview” in October is a great way to get your feet wet. “It’s distilled into the best tours and the best parties,” says Palm Springs artist Danny Heller. “And you don’t feel overwhelmed.” For more time travel, bivouac in a celebrity party pad from the era. Bobby Darin’s costs around $400 a night. For $2,200 a night you and yours can stay at the restored 1947 Twin Palms estate of Frank Sinatra, firing up his original hi-fi and sipping cocktails by the piano-shaped swimming pool. 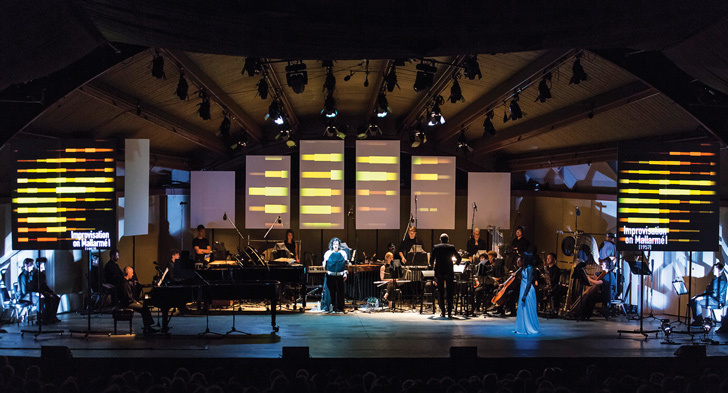 Not just a Coachella of the cello set, Ojai’s annual music festival blends its roster of concertos with jazz (Vijay Iyer, Nicole Mitchell) and talks. In between free concerts at the park and world premieres, browse boho housewares at main drag boutiques like Summer Camp or stock up on modern lifestyle goods at L.A.’s own deKor & Co. Next door to the luxurious Ojai Valley Inn and Spa ($389-$1,129), the Ojai Rancho ($149-$249), a revamped motel, spins retro vinyl with a side of cold beer. A preshow dinner at Nocciola stars handmade pastas and wild-caught fish. Of the 45.5 million tourists who visited L.A. last year, an ever-growing slice treated DTLA as something that had been unheard of in years past: a destination unto itself. You should, too. FYF’s arrival at Exposition Park is as good an excuse as any. Go big, though: Stay at the fully redesigned Hotel Figueroa ($300-$2,000) by Staples, or, even better, in the InterContinental ($263-$563), which opens that month in the city’s tallest building. Our Hot List (page 120) is replete with dining options if you don’t spend all your time FYF-ing, but for one-stop shopping, eat at Manuela in Hauser Wirth & Schimmel, the mega gallery in the Arts District. 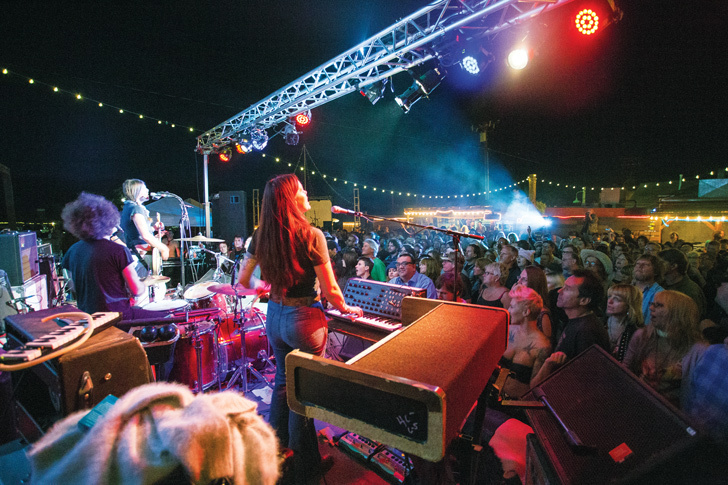 What started in 2007 as a small psych-rock fest called Clean Air, Clear Stars at Pappy & Harriet’s in Pioneertown has grown into a three-stage, three-day affair complete with camping on the premises. And thanks to a 1,200-person capacity (that other desert festival clocks in at 99,000 people per day), the gathering remains intimate, with the emphasis on the music over celebrity sightings and selfie snapping. 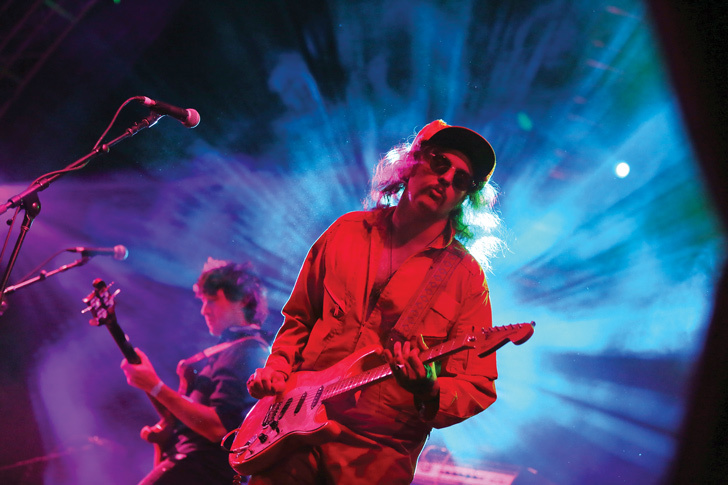 The lineup was still in flux at press time, but count on a mix of singer-songwriters, folk, electronic, indie, psych rock, and the occasional throwback like ’90s band Dinosaur Jr.
For a staycation with an edge, book a room at the new West Hollywood James Hotel ($399-$3,000) on the Strip. A sleek base of operations for straddling the line between plugged-in local and fresh-faced newcomer, it’s less than half a mile to Eveleigh for a happy hour-priced Inbetween Days cocktail under twinkling patio lights. With a rez you can skip the line at award-winning chef Kris Yenbamroong’s Night+Market for smart, authentic Thai (may we recommend the Startled Pig?) before rolling into the fabled Comedy Store. Come morning, the hangover-friendly breakfasts at Salt’s Cure are close by. The Ace’s thumping DJs aren’t the only option for desert trippers. 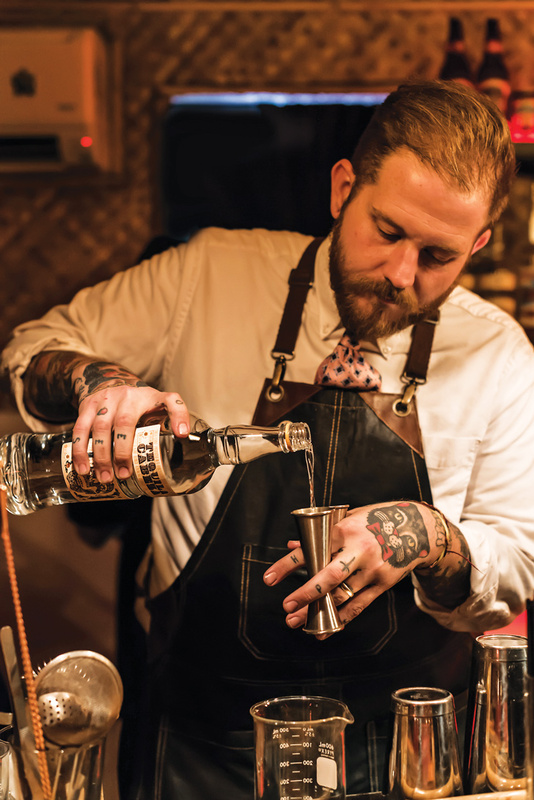 The tiki vibe at the tiny Bootlegger bar suits the city’s midcentury architecture, while the cocktails at Mr. Lyons’s backroom lounge, Seymour’s, channel Rat Pack leisure. Spot B-list celebs in the kitsch-loving gay-and-straight crowd at a Purple Room cabaret dinner show, or grab a beer and a slice at the locals hang, Bar. (There’s an even better pizza at Birba.) Your crash pad—the industrial-hip, 32-room Arrive ($249-$500)—doubles as its own destination, with a gastropub and poolside lounge. With 41,000 square feet of real estate, the Four Seasons Westlake Village spa is reason enough to stay the night. When not enjoying sessions in any of the 28 treatment rooms, recline on a plush lounger to the soothing sounds of a sculptural waterfall. After checkout, you can relax among the plantscapes at Gardens of the World in Thousand Oaks. Massages feel best when they’re earned, so explore the sea caves and tide pools along the rocky Point Vicente trail before returning to the Mediterranean-chic Terranea for hour-long hot stone or reflexology treatments. There are plenty of other great hotel spas in L.A., but none that feels this far away without being far at all. El Capitan is reopening this summer after surviving the classic California wildlands narrative: fire, flood, then mud. Classic, too, is the feel of El Capitan Canyon’s cedar cabins ($170-$800), arranged along a seasonal creek beneath a sycamore canopy. Soak in bathtubs, warm up by gas fireplaces, and doze to the sounds of the forest night in beds crafted from willow branches. El Capitan State Beach, at the canyon mouth, is easily reached by foot or on complimentary beach cruisers. Take in the sunset before having El Capitan’s deli deliver salmon and tri-tip to cook over your cabin’s fire pit. In a seaside community known for its Mediterranean vibe, the Pantai Inn’s cottages ($300-$800) bring a touch of Bali to Cali. Tropical umbrellas and plantings adorn a courtyard that, like some of the cottages, looks to the surf across Coast Boulevard. 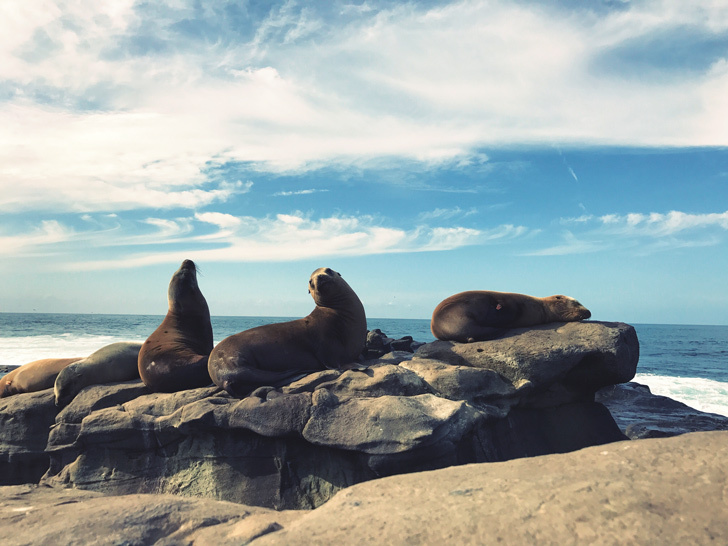 Explore tide pools and stroll along La Jolla’s low cliffs to see harbor seals lolling at the Children’s Pool. A staircase leads up to the village’s boutiques and the terrace at Catania, which serves an improbably good wood-fired pizza with broccoli and butternut squash. Or try the local catch at Pearl Street’s El Pescador Fish Market & Restaurant, a longtime favorite now located in more contemporary digs. Just north of Point Conception and 14 twisting miles off Highway 1, Jalama Beach County Park is renowned for the gusty winds that make its waters a prime kitesurfing spot. Campers and RV-ers flock here, but do yourself a favor and slip into one of the beach’s seven cabins ($120-$220). Neither quaint nor rustic, the simple Douglas fir huts sleep from four to six and offer kitchenettes and bathrooms as well as private porches and outdoor grills. 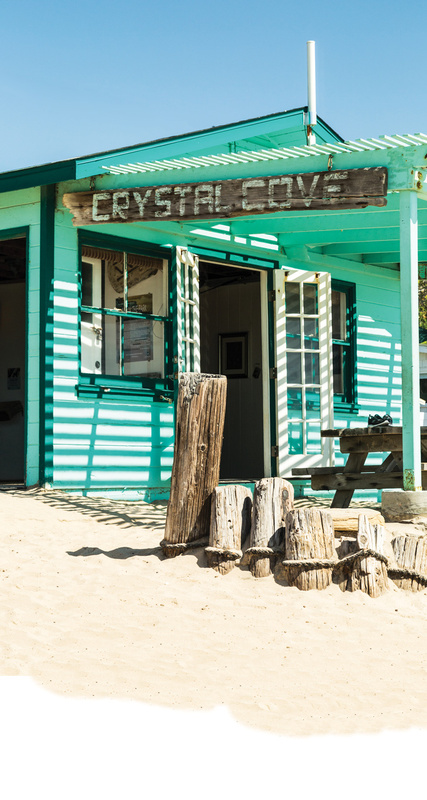 The California coast’s definitive beach burger can be had at the general store, and the ocean is just steps away, with miles of empty beach to the south. 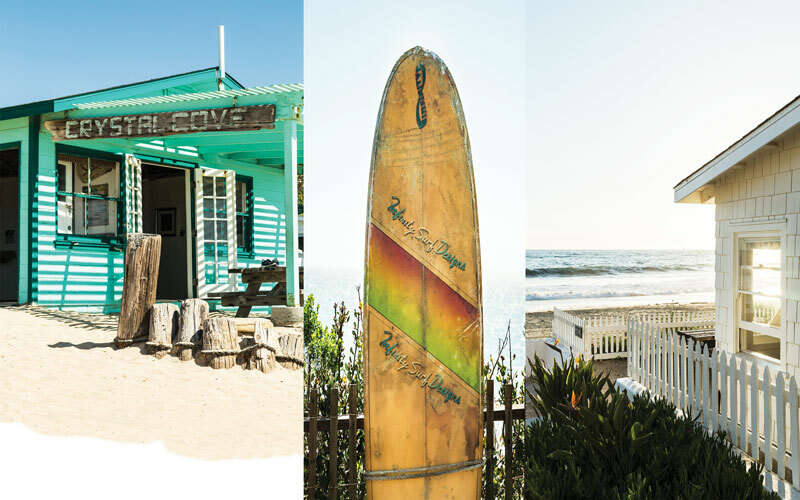 The Crystal Cove Beach Cottages ($35-$245) in Newport Beach are some of the most coveted coastal real estate around. Fourteen are available as private rentals, ten with dorm-style digs, plunking you on a 3.2-mile-long beach backed by bluffs. There’s hiking and mountain biking nearby in Crystal Cove State Park and a Maine lobster club sandwich at the Beachcomber café. If you can’t land your preferred dates on ReserveAmerica.com (best bet: Log on the first morning of the month, fill out a reservation form in advance, and pounce when the clock strikes 8), hang loose—cancellations do happen. Rough it for a weekend in a garden bungalow at the Fairmont Santa Monica ($424-$2,000) and you may not be all that motivated to return home. (Think of what you’re saving on airfare and gas.) Since you’re on vacation, don’t just hang by the pool: The Promenade’s right there. Oh, and so is the ocean. You don’t have to venture far for a good meal, either: At the hotel’s Fig restaurant, Yousef Ghalaini serves nuanced Cal-Med Middle Eastern dishes (pomegranate molasses-glazed lamb shank), and Miles Thompson has invigorated the legendary California cuisine of Michael’s nearby. We made one exception to the no-fly rule for this package: Vegas. For tips we went to DJ Steve Aoki, whose Grammy-nominated documentary, I’ll Sleep When I’m Dead, is aptly titled. Between producing records, going on globe-trotting tours, and holding down a residency in Vegas, the California native must use his free time wisely. Here’s how he bums around Sin City when he’s not behind a turntable. Hidden off Highway 101 in a cranny of San Luis Obispo Bay, Avila Beach was torn down and rebuilt in the late 1990s following a massive underground oil spill, which makes the 143-year-old hamlet California’s newest beach town. There’s now premium pinot noir at the Sinor-LaVallee tasting room, but you can catch hints of Avila’s original gritty charm along the Harford Pier while dining dockside on rockfish sandwiches and steamer clams at Mersea’s. Avila La Fonda is a dependable hotel ($200-$500), or if you’re Airbnb’ing it, stop by B.J. Enterprises for local ahi to cook back at your place. San Clemente isn’t a resort town, but it does offer a low-key alternative to pricier beach enclaves. And there’s even a briny pier. You can see it from the Beachcomber Inn ($170-$415), a motel in an old Spanish Colonial Revival building that inches along a hillside above. Loll on the front lawn, counting passenger cars on Amtrak’s Pacific Surfliner route as they rumble by directly below. Avenida Del Mar is where you’ll find boutiques to browse and filling stations like the Cellar, an of-the-moment wine bar. Keep heading toward El Camino Real, the town’s main boulevard, to sample the award-winning craft brews at Pizza Port. For a city of bland housing tracts and big-box retail, Goleta is surprisingly rich in natural wonders. To see them, stop at Ellwood Mesa, off the Winchester Canyon exit from the 101. Sperling Preserve: A sprawl of coastal bluffs and verdant meadows, the preserve’s 137 acres include the Goleta Butterfly Grove, in the middle of the mesa. Ellwood Mesa Open Space: More than two miles of trail allow access to Ellwood Beach, blessed with fluffy sands and rare snowy plovers. Coronado Butterfly Preserve: A stand of mesa eucalyptus has been outfitted with trails and seating for monarch watchers. Devereux Slough: Located just east of the mesa, the estuary is part of the Coal Oil Point Reserve and home to endangered birds, fish, and plants. Kimpton Goodland Hotel: Rest up at this boutique makeover of the old Holiday Inn ($149-$349), named after Goleta: The Good Land, a celebrated 1966 history of the area. 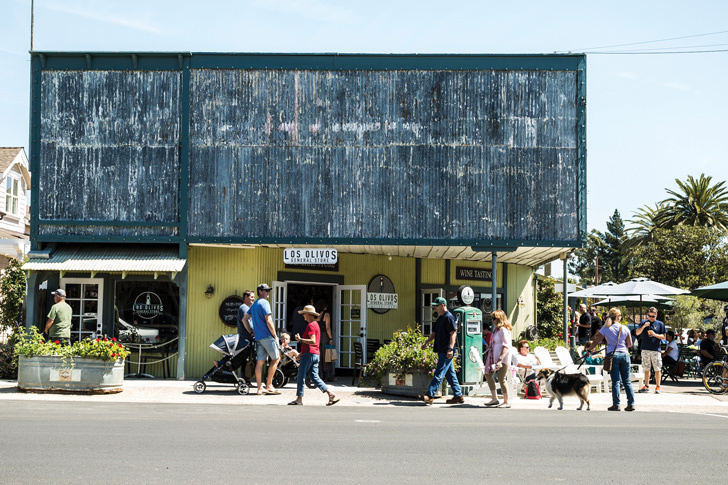 Equal parts small town and beach town, Carpinteria is California’s Mayberry del Mar. Linden Avenue, home to the gooey turtles at old-school Robitaille’s Fine Candies, leads to Carpinteria State Beach, touted as “the world’s safest beach” for its sheltered swimming conditions. A block from the surf, the apartments at Playa Lodging ($295-$995) set themselves apart with Viking kitchen appliances and patio fire pits. Two blocks away, Island Brewing Company is known for its Avocado Honey Ale and King Tide Double IPA. Back near the top of Linden, Rincon Brewery, named for Carpinteria’s fabled point break, serves tri-trip marinated in La Reina Lager. Dogs are welcome to roam unfettered on the town’s North Beach, by the old train depot. This is one of the coast’s wider swaths of sand, which means plenty of space for pooches to play. Your canine can join you for the night at the ocean-view L’Auberge Del Mar ($319-$4,900), whose recent makeover includes luxe linens and beach-themed art. For dinner go no farther than the hotel’s KITCHEN 1540, where chef Nathan Lingle produces a standout farm-truck eggplant “parm” and craft beer beignets with Julian pear cider sauce. Swimmers and paddleboarders dig the lakelike conditions at Butterfly Beach. But do yourself a favor and head south to Hammond’s Meadow so your dog can sniff the driftwood or roll in the high grass while you study the tide pools and an engraved Chumash marker. There’s even a creek to splash through. Dogs can spend the night at the beachside Four Seasons Biltmore ($695-$8,000), a Reginald Johnson masterpiece of Spanish Colonial Revival architecture. Opt for outdoor seating at the Pierre Lafond Wine Bistro in Montecito Village, and your pup can join you for dinner. The city’s dog beach lets canines romp leash free on a 1.2-mile stretch between Seapoint and Goldenwest streets. When it’s time to pack it in, hit the surf-themed Kimpton Shorebreak Hotel ($209-$499), where dogs can chill while you munch on tacos and crudos along the terrace at the just-launched Pacific Hideaway restaurant. It’s right by Main Street’s shops and the International Surfing Museum. Or go a few blocks south to Paséa Hotel & Spa ($219-$6,000), which opened last year and invites dogs under 50 pounds to stay in breezy contemporary rooms across from the ocean. The antique stores are the draw at this Santa Barbara enclave, but the scenery at Loon Point Beach is even more alluring—and free. Cross the freeway to Padaro Lane and the Loon Point parking lot. The high cliffs keep this beach secluded while lending a touch of drama. You won’t have to wash off the sand to dine at the Padaro Beach Grill, with thick hamburgers, crispy fish-and-chips, and outdoor seating under waving palms. After all that fresh air, sleep in country-style comfort at the Inn on Summer Hill ($249-$465). 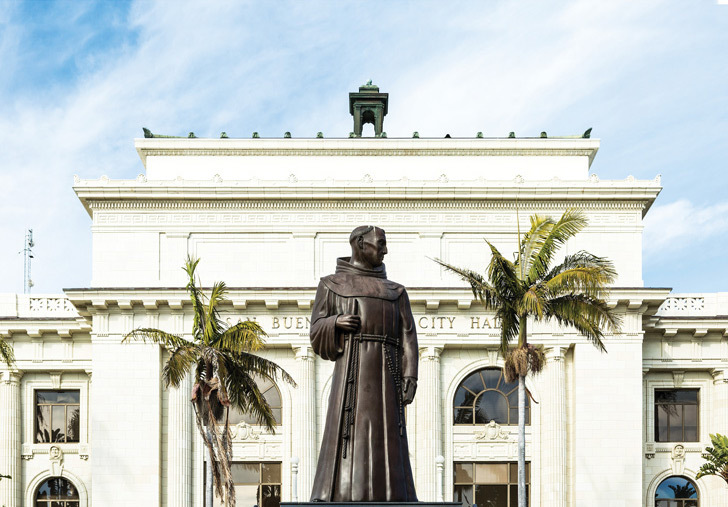 Though the frieze above the entrance to the imposing 1912 beaux arts City Hall grandly calls this town San Buenaventura, “Ventura” will do just fine, thank you. Soak up the ocean breezes as you pop into shops like the venerable Calico Cat Bookshop and the rootsy clothing and gear emporium Iron and Resin Garage along Main Street. Just past Mission San Buenaventura, Himalaya brings top-of-the-world cuisine down to sea level. 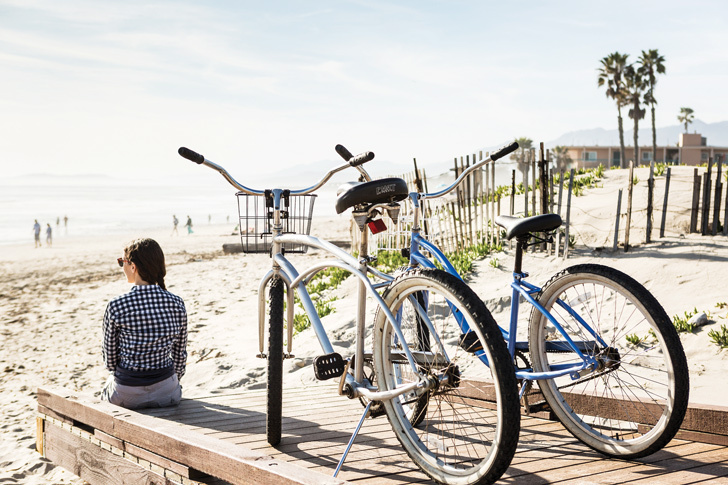 The beach is an easy five blocks away, and the four-mile-long bike trail will lead you within a couple of blocks of the reliable Ventura Beach Marriott ($166-$389). Nearby you can shuck your own bivalves at San Buenaventura State Beach’s the Jolly Oyster. The village feels more like a local haunt than a tourist destination, despite the throngs of beachgoers and road cyclists. Rent your own wheels at Village Faire Shopping Center (look for the 130-year-old Victorian manse that anchors it) after fueling up on a massive burg at Craft Burger. North of Carlsbad Premium Outlets, the suites at Four Seasons Residence Club Aviara ($325-$1,800) are showroom dreamy. Go for the kitchen counter experience at the hotel’s Seasons restaurant, enjoying courses like monkfish served with stone fruit.